Thanks to the generous support of the Alex Wilson Legacy Fund, and the participation of about 375 very outgoing people, the 2016 Boulder Balkan Bash was a huge, roaring success! 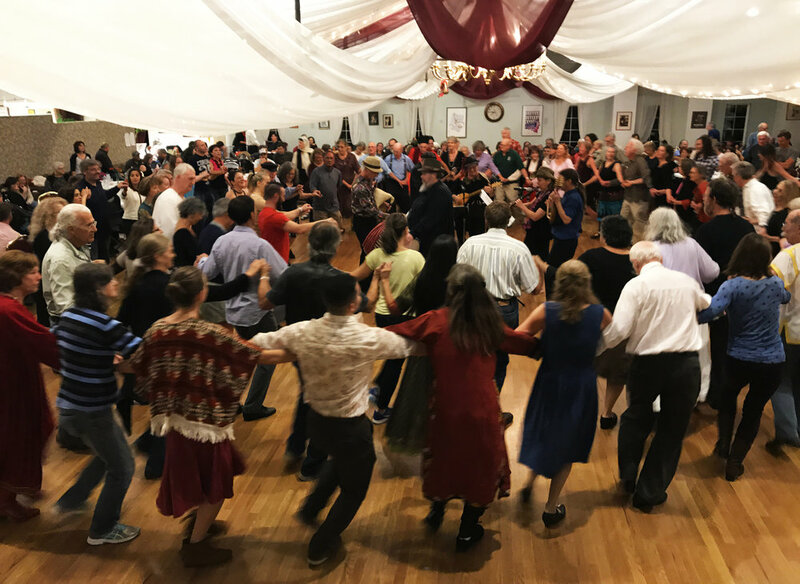 On Saturday, November 12th, dancers and enthusiasts from all over the Denver, Boulder, and Ft. Collins area gathered at the Avalon Ballroom in Boulder, CO, for a big evening of live Eastern European and Balkan folk music. Six area ensembles—Barbelfish, Sherefe, The Bitovniks, Planina, Ansambl Teodosijevski, and Gora Gora Orkestar—wowed the guests with their diverse repertoires, stirring melodies, and collaborative musical arrangements. All together, seven sets of dance music were played during the 5-1/2 hour party. There was truly something for everyone! Thirty-four volunteers, seven paid staff, and 38 musicians gave their time and energy to create the largest-ever Balkan Bash in Boulder. Old friendships were renewed and dozens of new dancers were shown how to join in the fun on the dance floor. There were upwards of six dance lines at many points in the evening. Even the non-dancers were able to relax and just take it all in following the gigantic potluck supper. The Avalon ballroom was packed with hundreds of people visiting and having a great time. Folk dance groups up and down the northern Front Range were represented, including Storm Mountain Folk Dancers, Boulder International Folk Dancers, Denver International Folk Dancers, Balkanika, One World Folk Dancers, Hora Romaneasca, VSM Dancers, and several others. This was the sixth such event to take place in the past 20 years, and the third in the past four years. Due to popular demand and the high level of enthusiasm, the Bash organizers are hoping to make the event an annual happening.